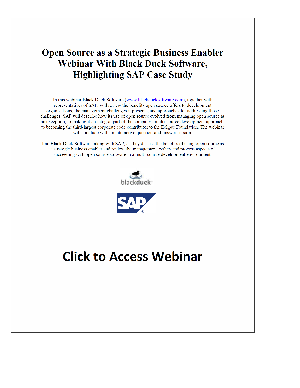 In this webinar Black Duck Software (www.blackducksoftware.com), together with representatives of SAP, will review the benefits open source offers to development organizations, the management challenges it presents, and approaches for addressing those challenges. SAP will describe how its use of open source evolved from managing open source as an exception, to making it an integral part of the company's multi-source development approach, to becoming the third-largest corporate code contributor to the Eclipse Foundation. The webinar will conclude with an interactive question-and-answer session. Join Black Duck Software, along with SAP, as they discuss the benefits of using open source as a strategic business enabler and review the management, policy and process aspects of succeeding with open source software in a multi-source development environment.